This has to be my favorite item I ever bought from amazon!!!! It’s beautiful in the picture. But in person, it’s amazing. Love it!!!! 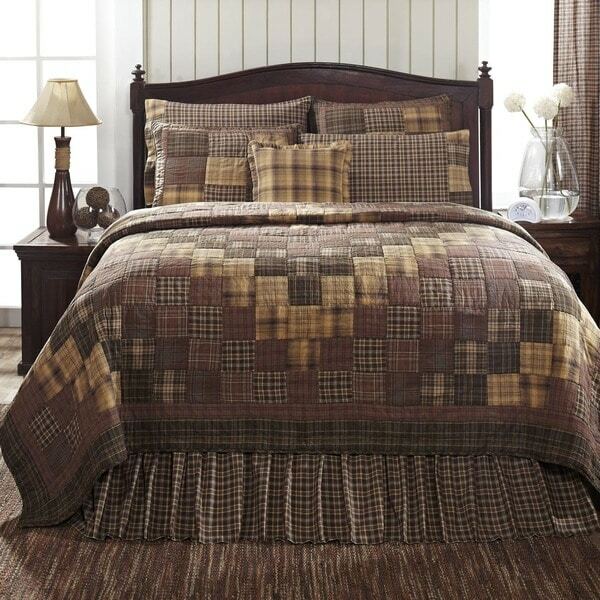 The Prescott King Quilt mixes russet, dark brown and earthy green for a masculine but subdued, lodge-style take on the traditional trip around the world patchwork layout. The picture does not do this quilt justice. The colors are muted tan & brown. It is a mid weight and the construction is what I have come to know about VHC. I bought a king to put on a queen bed because I like more drape on the sides. Its going up there as one of my favorites. If you like that country feel you will love this quilt. Beautiful quilt! I purchased the entire set (quilt, shams, bedskirt) and the set looks phenomenal in one of our spare bedrooms. Overstock was amazing to work with as well. Originally I purchased the wrong size quilt, but the return was so easy! I printed off a return shipping label directly from Overstocks website and just dropped it off at a local UPS office. I received emails indicating that Overstock received the return and credited my card! It was so easy! Highly recommend!!! Gorgeous quilt! Wonderfully made and heavy weight. Looks so nice on my bed! The colors are soft and muted, so would go with any neutral color scheme! Looks like a much more expensive quilt, so am very happy with the price! Love this quilt! It is made very well also love the shams and dust ruffle. The quilt is lightweight which we like. Colors are true to the picture. This is a very nice quilt. Very well made.I would recommend it highly. The only problem I had is the color wasnt to my expectations. We love this quilt!!! Best we’ve ever had. Made very well and colors go very well in our bedroom. Bought the quilt,shamsand bed skirt. Love it all. Quality bedding. Would highly recommend! Soft! Perfect for our manly guest room!! VHC is a wonderful quality company. These are the only quilt brand I ever buy and I have never been disappointed. Fits my room nicely. Well made. Good quality. Color was as advertised. I love it. Very much recommended. "What is the size of the (queen size version) quilt in inches?." The dimensions of the queen size quilt are 94 inches wide x 94 inches long. If you are buying this quilt for a Queen sized bed I would and did buy a king. The quilt is amazing, absolutely beautiful.